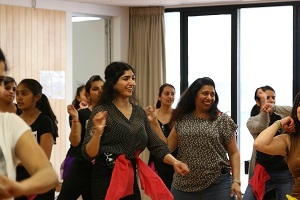 Learn Bollywood dancing and stay fit at the same time - a fun way to stay in shape. Whether you’re a budding dancer or just want to learn for recreational purposes or to socialise, you’ll shape and tone your body as you showcase a move or two on the dance floor. All you need is a positive attitude and a willingness to learn in this combination of traditional and modern Bollywood dance techniques. Bring a water bottle and wear comfortable clothing.